If God’s own messenger, the Archangel Gabriel, hadn’t called Mary by the descriptive title, “Hail, full of grace” (Luke 1: 28). And if Mary had not been covered by the Holy Spirit’s “unspeakable shadow” (see Luke 1:35). And if St. Luke, in describing Mary’s visitation to Elizabeth, hadn’t drawn a stunning comparison between the Virgin Mary and the all-holy Ark of the Covenant (see link below); and if Mary’s visit (with Jesus in utero) to Elizabeth hadn’t unleashed a veritable explosion of grace; and if, at the sound of Mary’s voice, Elizabeth had not been filled with the Holy Spirit and boldly proclaimed Mary to be “the mother of my Lord” (Luke 1:41-45); and if Mary, so uniquely full of grace, did not proclaim that “my soul does magnify the Lord” (Luke 1:46). And if Simeon the prophet had not peered down through the decades to see that Mary, who had brought the baby Jesus to the Temple, was predestined to share closely in Jesus’ passion, saying to Mary, “And a sword will pierce your own soul too” (Luke 2: 35). And if Mary’s role as a powerful intercessor hadn’t been so clearly manifested at the wedding at Cana when she moved her Son to work His first public miracle against His own will since His “hour had not yet come” (John 2:1-12). And if the Lord Jesus Himself hadn’t bequeathed Mary to us (from the cross) as our spiritual Mother as He was meriting our very salvation, saying, “Behold, your mother” (John 19: 25-27) as she stood faithfully at the foot of the cross in fulfillment of Simeon’s prophecy. And if Saint Luke hadn’t specifically pointed out that Mary was present with the Apostles in the Cenacle in preparation for Pentecost” and the “birth of the Church” (quotations from Pope John Paul II; see Acts 1:14). And if Saint John hadn’t seen Mary in a vision of heaven, “clothed with the sun” and wearing her Queenly crown of twelve stars (Revelation 12:1-2); and if Old Testament typology and New Testament fulfillment didn’t point to Mary as the New Eve and Queen Mother (see especially Scott Hahn’s masterful book, Hail Holy Queen). And if the testimony of the Catholic saints didn’t overwhelmingly verify beyond all peradventure the amazing assistance Mary provides to those who accept her spiritual motherhood (which Jesus merited for us), leading them to greater union with Jesus, perhaps then you could persuade me not to accept all of the beautiful and sublime teachings about her by the Roman Catholic Church, the only church in Christendom which can trace its origin directly back to Jesus and the apostles (and thus to Mary herself, Mother of the Savior). P.S. Perhaps, gramatically, each paragraph should end with a semicolon, since I originally wrote this as one entire sentence. 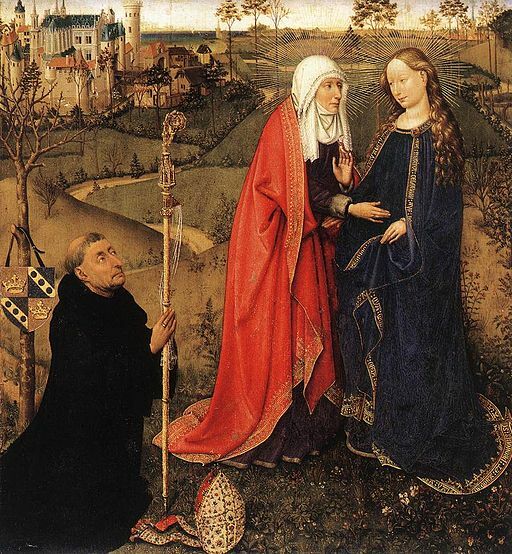 Image: Visitation, from Altarpiece of the Virgin (St Vaast Altarpiece) by Jacques Daret c. 1434 – 1435. Staatliche Museen, Berlin. Public Domain, U.S.A.